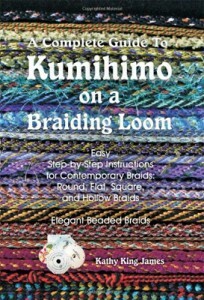 In Japanese, the word kumihimo means to gather or combine cord or thread. As the ornately jewel-like ropes suggest, modern kumihimo can involve many strands. At first, the process was done entirely by hand without the help of any sort of tool. These earliest kumihimo are generally monochromatic or at least very limited in color. Later, weavers developed tools that could accomplish more complicated patterns, permitting makers to include more colors. The first kumihimo looms, called takadai and marudai, are rather large and unwieldy, and fairly stationary. added pendant or bead. 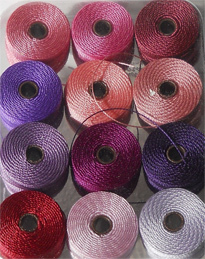 Because it consists of many strands of tough and durable silk, kumihimo can take a lot of wear and tear. It makes a dependable and unusual dog leash, purse strap or belt. The method of weaving kumihimo from many strands creates endless possibilities of color combinations. Unlike the old-fashioned looms, the one included in the Starter Kit is both easy to use and portable. The KumiLoom disc, made of a lightweight and durable foam material, is the perfect size to take along to use in spare moments. A booklet includes detailed instructions for the kumihimo technique, and a briefer version is printed on the KumiLoom itself for quick reference. Everything about the KumiLoom Kumihimo Starter Kit is designed to help move the user quickly and easily toward the production of gorgeous braided cord. The 12-page instruction booklet clearly lays out the basic technique and provides a few pattern variations. Its illustrations usefully support the descriptive text. The flexible bobbins also included in the Starter Kit simplify the manipulation of many threads and prevent frustrating tangles by holding the ends of the individual strands separate from one another. The KumiLoom disc itself makes weaving kumihimo a pleasantly relaxing way to pass the time. The notches around the outside edge of the loom are numbered, and into these the weaver slides a silken strand. A notch on the opposite side takes another strand, and so on until all strands are in place. Then the weaving begins. With the KumiLoom included in the Kumihimo Starter Kit, weaving kumihimo is as simple as counting. First the weaver moves a strand of silk to the notch below and to the right. Next, the movement is up and to the left. Finally, the whole loom gets a turn to the left. 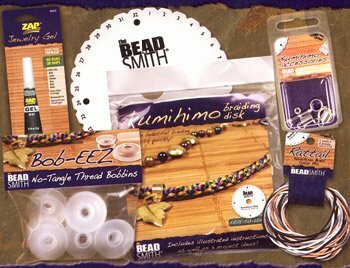 It is remarkable that this easy 3-step process can lead to the elaborate patterns of kumihimo. Kumihimo can be as long, as colorful and as complex as its maker wants it to be. The KumiLoom Kumihimo Starter Kit provides everything necessary to become an adept practitioner of this ancient skill. 12 fios; 16 filos, ……32 fios e etc. Voces podem informar-me onde enconto essa literatura? HOw do I do a cord that has areas of plain color for two or three inched with a core of about 6 or eight colors when another colors is brought to the surface and is solid for a few inches and then another color is brought to the surface. Always one color at a time. I have design a complete jewellery collection after teaching myself to use the Kumihimo Kit would love to share my web site coming soon.